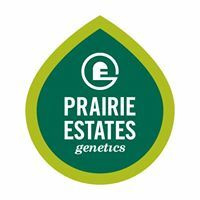 Prairie Estates Genetics (PEG) is a national Forage Management company based in Middleton, Wisconsin. PEG's team of skilled Forage Managers provide their clientele (dairy farmers) with the highest quality dairy-specific hybrid seed. The farmers then grow and chop these plants to make forages to feed their herds. PEG Forage Managers provide their clients with year-round service to ensure absolute consistency in their forages 365 days a year. PEG Forage Managers are out in the fields, checking-in with their clients all the time, and travelling to remote locations around the country. Their challenge was to streamline their company's processes digitally -- even when they are out in the field far from WiFi signals and phone service. While the agricultural industry is one of the oldest industries, still populated by fax machines and the like, PEG is no stranger to modern technology. In recent years they have experimented with various cloud solutions; they had just migrated to Microsoft Office 365 when they first encountered Cloudbakers. To PEG, Office 365 felt overly complex; for a company of their size (<10 users) there were too many options. It was too difficult to make changes and their IT team was always on the phone with Office 365 support. Most importantly, however, the file sharing was simply not up to par. They needed a better method of collaboration. Years ago the president of PEG had been using Act for customer and contact management. Unfortunately their experience with Act was not a pleasant one--they ended up losing large quantities of their data. This was enough to drive them away from CRMs for the time being. Instead, they began keeping notes spread across computers and/or handwritten in binders. This take-it-as-it-comes system may have been sufficient when they were only a few employees, but after tripling in size (with clear signs of further growth on the horizon) they knew it was time to invest in a better system. Luckily, PEG wasn’t too far invested into Office 365 when they encountered Cloudbakers. Nicole Rogers met Cloudbakers’ Mitch Greenwald and Shaun Banta at a Zoholics Conference in 2015. By this time PEG had begun using Zoho, but their outsourced IT company at the time (they have since moved on to work with Fulton May Solutions) was in a bit over their heads and the powerful CRM wasn’t being used entirely correctly. When Shaun explained to her the impressive integration between Google and Zoho, Nicole decided it was time to jump ship on Office 365 before it was too late. Although PEG is relatively small in size, their users are spread across locations. As such, their Google and Zoho trainings were completed via GoToMeeting & Google Hangouts. 2 trainings for each platform were conducted, followed up by a Q&A session for each one month later. Nicole states, candidly, that people don't love changing systems. She’s right--these transitions are often met with hesitancy. She explains, however, that "G Suite is really elegant and easy to use, both on a basic level and on a higher level that isn’t too difficult to wrap your head around." The PEG team's favorite features thus far have been Chrome Profiles, Google’s file sharing, and Google Hangouts. Coming from Office 365, the file sharing capabilities of G Suite are far superior. The PEG team is finally able to collaborate team-wide on documents, confident that everyone is editing the same, up-to-date version. They have also enjoyed the ease with which one can access Hangouts from their email interface. It’s built right in, seamlessly, which is a huge incentive to hop on a video call whenever you need to connect. As for Zoho, Nicole notes that they are finally coming to understand its full capacity. Their sales staff is utilizing the CRM tools much more than before (and doing so correctly!) and the mobile app is much more functional now. This allows their Forage Managers to travel confidently, knowing their valuable sales and client information is readily accessible on-the-go. Having undergone both an Office 365 migration (pre-Cloudbakers) and a G Suite migration (with Cloudbakers), Nicole had useful insight into the differences of each. She explains that while their previous Office 365 migration went over fine, the Cloudbakers-run migration to G Suite was different. 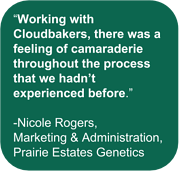 Almost unable to put her finger on exactly why this was, she states “there was just a feeling of camaraderie throughout the process that we didn’t experience before.” This is exactly the sense of teamwork and collaboration Cloudbakers strives for. © 2019 Cloudbakers. All Rights Reserved.